One thing I’ve noticed over the years is that not everyone really understands what foods are in season throughout the year. Since I’ve realized that many people don’t know what foods are in season during each month, I’ve decided to write an article every month listing some of the most common foods that are in season that month. Another tip I have for those of you who live in an area with long winters is to preserve some of your fresh fruits and veggies. Another thing I recommend that you do is see if any local farmers near you have a weekly farm share you can buy. Alright so let’s get going! Here is what you should buy at your farmers market in June! Since most grocery stores ship in their fruits and vegetables from other areas around the globe, many of us don’t realize that we’re eating foods that aren’t in season locally. I always recommend that you look into buying food from your local farmers market. Not only does it taste WAY better, but you also are supporting local farmers! And I love local farmers! All of the local farmers I’ve met are some of the best people I know, and so I love shopping at my local farmers market to try support them in any way that I can. Obviously this will vary depending on where you live in the United States (and it will definitely vary for my readers outside of the U.S.) so this is a very general guide of what fruits and vegetables are the ones you should be looking for each month at your local farmers market. One of my favorite tools to use is the Seasonal Food Guide. I love using this website because it can tell you EXACTLY what is in season in your area. You just put in your zip code and it tells you exactly what to look for at the farmers market! Now if you live somewhere like California, you’re a lucky duck because EVERYTHING is in season for most of the year. Which makes it a lot easier to eat a variety of yummy fruits and vegetables year round. However, if you’re like me and live somewhere that doesn’t have the amazing weather California does, you have to be a little bit more creative during the winter. Which is why I use the Seasonal Food Guide to help me find things that are in season. I personally prefer other methods besides canning, mostly because I think it’s easier and tastes better. In fact there are many ways you can preserve foods without canning! I’ll buy some extra fruits and veggies at the farmers market and preserve them, so that I can eat local fruits and veggies year round. In my area there are several farms that allow you to purchase a “farm share” at the beginning of the growing season, and then you get to pick up fresh fruits and vegetables every week! It’s a great way to motivate yourself to try new fruits and vegetables that are in season in your area and support local farmers. So apricots are my FAVORITE! My grandma had a huge apricot tree that produced like crazy during June and so her yard was speckled with little orange apricots that fell off the tree before my grandpa could pick them. Needless to say there were always A LOT of apricots around. 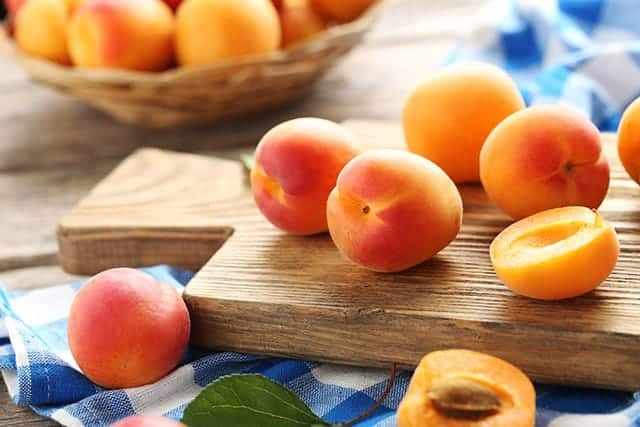 One of my favorite things about apricot season is apricot jam. I love this recipe from The Vintage Mixer because it’s easy. And I’m all about easy. Speaking of easy, I always check my local farmers market for homemade jam. Mostly because I’m lazy and hate making jam myself, but also because other people’s jam tastes way better than mine. Ok, ok. I do love chickens and I love eggs. I highly recommend that everyone have their own chickens! In fact I wrote a whole book about how you can naturally raise your own backyard chickens! But I understand that it’s not possible for everyone to raise their own chickens. If that’s the case for you, then you should buy your eggs at your local farmers market! It is really important to me to know that the chickens laying the eggs I eat are raised naturally and are happy, healthy hens. So I always feel better buying eggs from a local farmer. Then I can talk to them personally about how their chickens are treated and I can eat my eggs happily! I’ve collected more than 50 egg recipes (We have a lot of eggs around here) that you can use after you buy your delicious eggs from the farmers market! You can find them right here! So June is when peas are in full swing around here. And I love peas. I think they’re an amazing snack! Just down the street from me there’s a farmer who actually sells his peas shelled. And it’s amazing. It’s the lazy person’s way to eat peas and I love it! One thing I love to do is freeze peas every year. That way I can eat peas all year long. I don’t blanche my peas before I freeze them. All I do is spread my freshly shelled peas out on a cookie tray and then put them in the freezer for about a day. Then after they’re frozen, I scrape them off with a spatula and put them in gallon size freezer bags. It’s so easy to do and it allows you to have yummy peas all year long! Check out this super yummy Pea and Parmesan Wonton Ravioli recipe! It’s a great way to use some of your frozen peas. One of my favorite things about June is the beginning of the berry season! I love berries, and I could eat them all day! Blueberries are definitely one of my favorites! Blueberry Muffin in a Mug. One of my favorite things about blueberries, is making blueberry muffins. But I’ll be honest, if I make an entire batch of blueberry muffins, I’ll eat ALL of them. So I like to make blueberry muffins in the microwave! This recipe is super easy and you get a delicious muffin you can make in a mug! I use my awesome chickens are cheaper than therapy mug to make these amazing muffins! 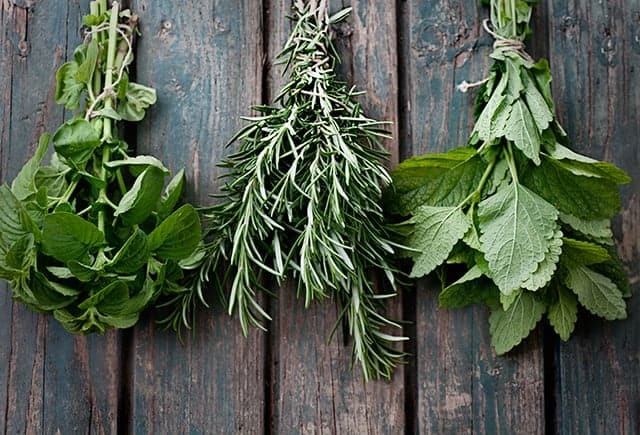 Depending on your area, June is when fresh herbs start showing up at the farmers market! Not only a herbs great for your chickens, but they also add an amazing flavor to any meal! One of my favorite herbs to buy at the farmers market is oregano. I use oregano in the coop, and I use it in a lot of my meals as well! I even sell dried oregano in the store here that you can use all year round! Here are some of my favorite summer recipes that use fresh herbs! I also highly recommend that you try growing herbs yourself! Herbs are fairly simple to grow and they have huge benefits for your chickens and they taste great! What are you planning on buying at your local farmers market this month? I’d love to hear about it!